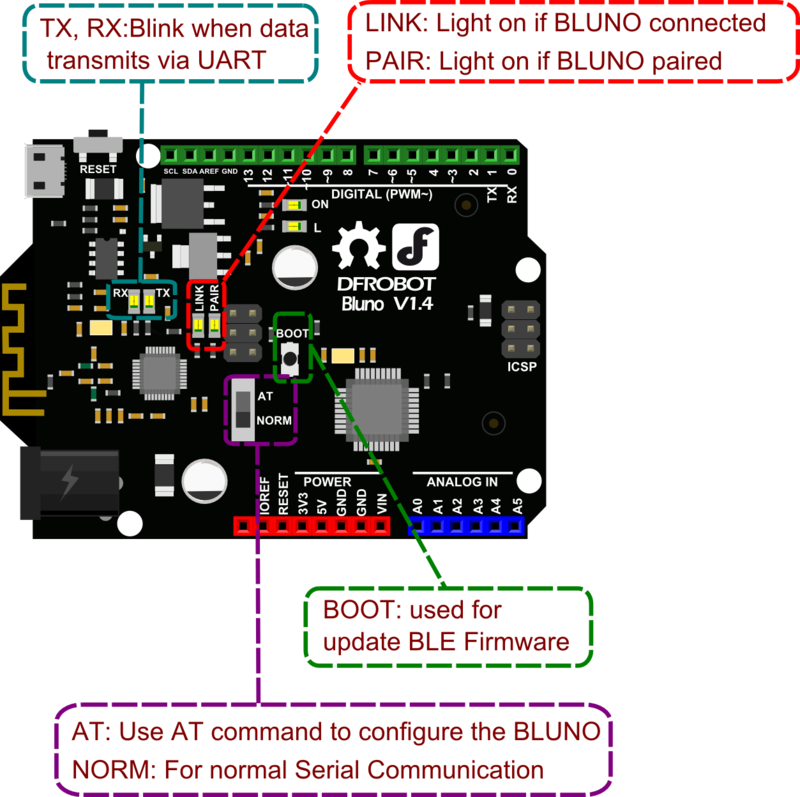 It's time to get Bluno - An Arduino Bluetooth 4.0 (BLE) Board into your arduino project, together with your phone! For aficionados of smart devices and wearables, now you can go further than hacking things bought in the market to building your own prototype out of garage. The Bluno board is the first Arduino board intergrating BT 4.0(BLE) module, making it an ideal prototyping platform for both software and hardware developers to go wireless. You will be able to develop your own smart bracelet , smart pedometer and so on. Through the low- power Bluetooth 4.0 technology, real-time low energy communication can be made really easily. What's more, we also developed the App for the Bluno (both Android and IOS), and they are completely opensource, so that you can modify and develop your own BLE-hardware platform. For the demo application and Arduino code, we integrated dfrobot wireless libraries for the beginners. The idea is to offer a simple way for you to use wireless modules without learning the sophisticated wireless comunication protocol. However, for the developer, recommend to custom or choose the protocol according to the product features or the application. By the way, except of many other BLE products, we also developed the Accessory Shield for Bluno for you to help you build your idea faster and easier, enjoy your wireless journey! Keep Your Bluno Updated We have released a new version bootloader which is much more stable than the last version. Especially that it can resist in insufficient power supply, motor magnetic-field interferenceit, etc. Visit forum to find how, How to upgrade DF BLE device bootloader to 2.0? NOTE: If you want to use a computer to communicate with Bluno, a BLE link or USB BLE link is needed, the BLE on your computer is not compatible! This section is focused on the basic function of Bluno. You can easily develop your own Android application based on this Demo. 1. If you stuck in any of the following process, Go to Trouble Shooting section for help. 2. Install the Arduino IDE. 4. Select the "Arduino Uno" as the target board in Menu->Tools->Board and its serial port. NOTE: If the Bluno was connected, i.e. the LINK led is ON, then it will fail to upload any sketch since the Serial port was occupied by the BLE. Please unlink the connection. 6. Install the APK file into your Android phone. 8. Click the "Scan" button（①） for scanning and select the device. 9. After connected, Click the "Send Data" button（②） to send the message in the text view(③) to Bluno. 10. The Bluno will reply with the same data. Thus you can see the same "received data" （④）. In this section, we will learn how to Upload the sketch on air via BLE. 1.There are two different roles of BLE devices , CENTRAL and PERIPHERAL. So if we want establish transparent communication, one device should be configured to CENTRAL, while the other should be configured to PERIPHERAL. 2.Turn the switches to "AT"(Before V1.7)/Input "+++" (After 1.8) in the Serial port to enable the AT command mode. 6. "AT+BLUNODEBUG=OFF" will make Wireless Programming more stable. However in this mode, you can not monitor the Serial port through USB on PC. 7. Turn the switches to "NORM"(Before V1.7)/ Input "AT+EXIT"(After V1.8) to exit AT communication mode. 8. Unplug the USB connection of the PERIPHERAL one, and use other external power supply like battery. 9. In seconds, the Link LED will be on, which means they have connected. 10. Click Upload, and sketch will be successfully uploaded to the PERIPHERAL device. NOTE: The setting will be reserved after the update. So if you want to apply Factory Settings, just use the AT command AT+SETTING=DEFAULT. This step is only for the early versions of this board 1.6 and previous firmware. For version 1.7 or later. Skip to next section Version 1.8 or later. NOTE: This method is only compatible with Windows XP, and Windows 7. Windows 8 and 10 versions might not work with this method. 1.Press and hold the Boot button on Bluno and connect computer through USB. After power on, release the button. 2.Computer will recognize the Bluno as an USB flash drive. 3.Open the disk and delete the "*.bin" file. After that USB flash drive will automatically reboot and be remounted. 4.Unpack UBL2SBL.bin (this link) patch into the Bluno flash drive. 5.After it automatically reboots, and we can proceed with step 2. On Version 1.7 ( and later ), firmware can be uploaded using the following software. Click on the revelant link for your Operating system. 1. Press and hold the boot button down 2. Connect the USB 3. Two LED flash alternately 4. Download and decompression the Firmware in the Document section ( This is the Link ) 5. Load the firmware file (For Bluno or Bluno Nano, please use "SBL_BlunoV*.bin". For BLE-Link, please use "SBL_BLE-LinkV*.bin") 6. Click the upload button and wait 2 minutes. The AT Mode Switch becomes useless at Firmware version V1.8 or later. 6. If the AT Command Mode is successfully Entered , you will receive "Enter AT Mode"（⑤） from it. 9. If the BLE is successfully configured , you will receive "OK"（⑤） from it. 1. Turn the on-board switch to "AT" and AT command mode will be entered. 2. We need a serial monitor for configuring the BLE in this part. There're lots of good tools like putty,CoolTerm and Arduino serial monitor. In this case, we choose the Arduino Serial monitor, which is easy to use. 7. If the BLE is successfully configured , you will receive "OK"（⑤） from it. 8. If received "ERROR CMD" instead, try sending it again or you should check whether the command is correct or not. 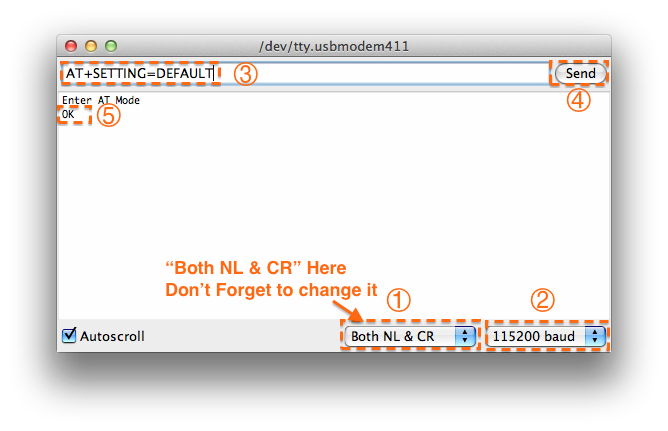 NOTE: <CR+LF> means Carriage-Return and Line-Feed, which is the same meaning with "Both NL & CR" in Arduino Serial monitor, do not include the string "<CR+LF>" itself. 1*. "AT+KEY" to simulate pressing some buttons in HID mode, read FAQ 16 below for How to use HID mode. AT+SETTING=?<CR+LF> Request the setting mode (default: DEFPERIPHERAL). If the settings are changed by AT command, "UNKNOWN" will be replied. Turn on the BLUNO DEBUG so that when Bluetooth is connected, we can use the serial monitor to get the UART message. AT+BLUNODEBUG=OFF<CR+LF> Turn off the BLUNO DEBUG so that wireless programming will be more stable. Turn on the BLUNO DEBUG So that when Bluetooth is connected, we can use the serial monitor to directly get the Bluetooth message from IOS or Android device. AT+USBDEBUG=OFF<CR+LF> Turn off the USB DEBUG so that wireless programming will be more stable. AT+IBEACONS=OFF<CR+LF> Disable the iBeacons feature. Request the version of the firmware. Exit the AT Command Mode. Q 1 Two Bluno/ BLE devices cannot communicate properly? Check if the serial port is used correctly if you use Leonardo, Mega etc which contains multiple serial ports. e.g. Leonardo uses Serial1. ****() instead of Serial. ****() for the I/O Pin 0,1. The Serial. ****()is for the USB port. Q 2. Why I can not connect Bluno by my iPhone/ Android phone(5.1 version)? I am sure they suppot BLE devices(syetem version & BLE module). And it required a password, what's the password? A: 1. Please connect Bluno using the App developed by DFRobot like the one above called Bluno Basic Demo, it requires no password. If you have hit the Bluno through Setting Panel, and connected(or not), please hit on it again to remove (forget) this device from your phone, and then use the app to search and connect. 2. The password was for the HID connection, actually once you set HID mode, it requires no password or PIN. surely HID mode should be previously set by AT+FSM=FSM_HID_USB_COM_BLE_AT. 3. By the way, you should notice that other Apps for BLE talk might NOT compatible. If you need to develope your own App, you can customize the BlunoBasicDemo which is open source. Link. A: Please follow the post to check what's wrong. Romeo BLE could not be found. Q 4. Why I can not upload my code wirelessly using Mega2560 + Mega Sensor Shield V2.4 + BLE link ( On socket COM0) which was used to program to another Bluno? A: 1. Sorry it's NOT supported because the expansion shield's Serial port0 are connected with the Mega I/O pin 0,1 directly, so it can only be updated wirelessly by other BLE device. 2. If you use IO Expansion Shield for Arduino V7.1, it's no problem then. Only note that you have to turn the switch to Prog when it was going to update other BLE device. On the contrary, turn it to RUN when it was regarded as the receiver. 3. Check if you plugged the BLE link module in the expansion shield reversed. 4. A suitable power supply is required. One of our customer use 5V@8A adapter to power a BLE card, even he tried everythinig, he just can not make it, once it was replaced by a simple USB cable from computer, it got success then. Q 5. Is it possible to flash Bluno firmware to a new CC2540 chip? I want to make my board with a totally new CC2540 and Atmega328. A: Yes, we have made the method public. Please read How to flash a new CC2540 chip with DFRobot BLE service? Q 6. How to use the Ibeacon function? A: You could turn on/ off Ibeacon function/ change major/minor by AT command. Or download an App for Ibeacon finder to check the BLE devices as Ibeacon tag. But it doesn't support the functions like change uuid, battery level information etc. A good news is that a firmware will be released freely for developers, you could add more interesting functions in Bluno! Q 7. Is it possible to connect several peripherals BLE to a single CENTRAL one? A: No, mesh network is not supported so far. But it can be made more or less equivalently by switching the LINK between the central and peripheral ble one by one. Read more. Q 8. I'm trying to send data from the bluno to the phones but there is a problem with the IOS devices. The devices don't receive the right datas, I mean it's unreadable. A: Please use the AT command AT+UART=115200 to set the BLE device (Bluno/Bluno nano) baud rate at 115200bps. Install the Arduino board driver manually. Uninstall the device and install the Arduino board driver manually. 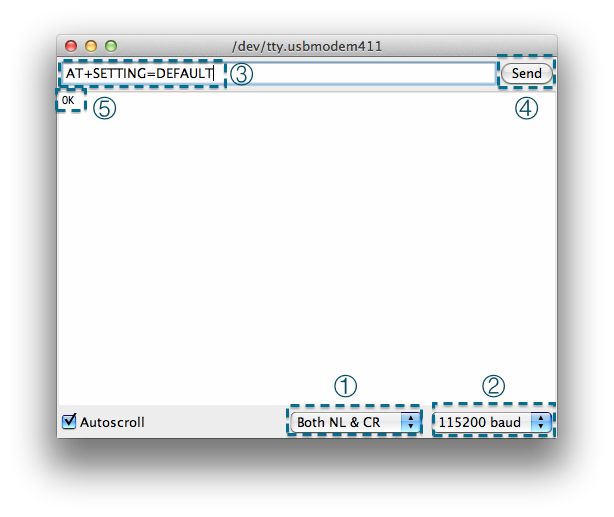 Select correct Board and Port in Menu bar -> Tools. Remove the wires on serial port, i.e. Digital pin 0,1, if there were. If the LED Link was ON, please disconnect the connection between Arduino card and your phone/PC /BLE device, make sure the LED link is OFF. Some inappropriate settings by AT command. Please read Q1 (above), Step1&2. You can get a replacement if it's in warranty. Or you can also try to fix it by yourself. How to flash a new CC2540 chip with DFRobot BLE service? A. There are two possible reasons about this error info. The software might be failed to recognize the serial port if you have unplug Bluno from your PC while the software in running and re-plug it to your PC again. If so, please restart the software again and try. Bluno is NOT in Update Firmware Mode if you don't see the 2 LED (PAIR&LINK) flashing, i.e. you forget to press the button BOOT before you plug Bluno to PC. A. There are two methods to accomplish your idea as you could find some hints in AT command list above: How to Configure the BLE through AT command? As you mentioned, as long as two modules are set to Master and Slave, they will build connection automatically. But since the BLE can only support one-one connection, not mesh network, so you could use method2 to avoid the problem while multiple BLE devices working at the same place. A. This is a compatibility problem. DFRobot BLE series products are all compatible, while not with other brand. This is why even with a pc(Linux, Windows, Mac etc.) which has the BLE feature, you still need to use a USB BLE-Link to work with our BLE product. A. The bootloader was lost. If you can get a CC debugger, you could follow How to flash a new CC2540 chip with DFRobot BLE service? to fix that. Read here, Common Arduino Operation Notes. ---> No.1 for the possible reason and how to avoid it. Q14. About UUID. I am trying to connect to the Bluno Nano V1.3, what is the UUID I need to use in android studio? Q15. I run your app BlunoBasicDemo on my iPhone, however, when it was run in background, the LINK will be disconnected. I tried on different BLE devices with another BLE app, it supports Connection in background mode. So my question is how to find and pair Bluno when the app was in background mode? Q16. How to use HID mode of Bluno? A. There is a post by Cain showing how to use Bluno as a HID (Human Interface Device). Any questions could be asked there. NOTE: We found a bug that it doesn't work with Android device. But pc with BLE feature and iOS devices are compatible. How do I know my Bluno is connected in code?/ How do I know the distance/RSSI value in code? How to control LED wirelessly? IoT Application developed by Thomas Jay using our Bluno, source code on Github.